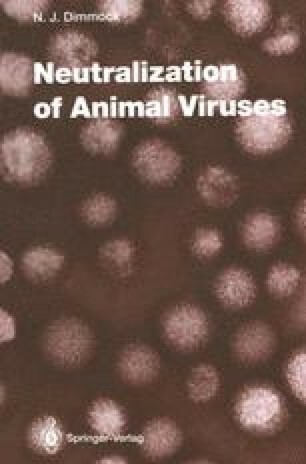 Data relating to the IgG neutralization of poliovirus are discussed in this separate section since they are complex, unclear and sometimes apparently conflicting despite the wealth of knowledge about the antigenic properties of the virus (Minor 1990) and its structure at the atomic level (Hogle et al. 1985; Filman et al. 1989). Rhinovirus data are from Colonno et al. (1989). The few data on IgA neutralization (Page et al. 1988; Mosser et al. 1989) and IgM neutralization (Chesebro et al. 1968; Mandel 1967a; Svehag and Mandel 1964; Svehag et al. 1967; Thomas et al. 1986) of poliovirus are discussed in Sects. 9 and 10, respectively.